Discoveries, thoughts, and writings from my world. 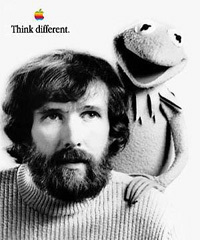 Jim Henson was a creative genius. He collaborated with not only Writer / Director George Lucas, but also music legend David Bowie, fantasy illustrator Brian Froud, and The Walt Disney Company. His legacy includes the worlds of The Muppets, Sesame Street, The Dark Crystal, Labyrinth, The Fraggles, The Storyteller, and many other fantastic characters and franchises. In a documentary about Jim, his son Brian accurately remarked: "His vision was a very simple one about life and about people and a very honest one. The vision of the world of Muppets, and the world of Dark Crystal, and the world of Labyrinth, and world, and world, and world. How many worlds can a guy have in his head? He had a lot, and they were still coming fast and furious." The Muppets, including the puppets on Sesame Street remain his most popular creations, and they are recognized all over the world. Many adults today, can thank Kermit and company for their early literary and artistic comprehension skills. 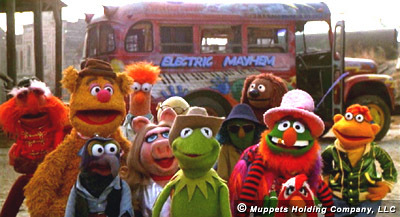 Despite the solid history of The Muppets, there have been ownership transfers since Jim's death in 1990. The Jim Henson Company, including all of their creations, were sold to a European media corporation, EM.TV, eventually purchased back by Jim's children (to the delight of many fans) and a year ago, sold to The Walt Disney Company. The Jim Henson Company assured us the move was done to follow Jim's wishes of keeping the characters 'evergreen', and only one company, Disney, really had the power to do that. In fact, years ago, when Henson was still alive, The Walt Disney Company was in discussions with Jim Henson regarding a partnership, and perhaps even an outright purchase of The Muppet characters. Some feared that Disney CEO Michael Eisner, only acquired The Muppets to boost his sagging ratings with Disney shareholders and that the characters would continue to be pawns in a game. Another major issue was that it would possibly be years before the fans were able to see a new Muppet television show or film. Disney assured the fans, that they would do everything in their power to focus on Henson's wish of keeping The Muppets alive. To date, The Muppets have made a few guest appearances on talk and award shows, even co-hosting in some cases, appeared in a music video with Weezer, television commercials with Jessica Simpson, and are about to take center stage in a Muppet-ized version of The Wizard of Oz. Recently, Disney launched their new Muppet website. Not all of the content is live, and the site requires a decent computer and internet connection to work efficiently, but at the very least, The Muppets are again providing official content on the World Wide Web. However, even before Disney's new portal, admirers of the characters have kept the information flowing on the Internet through various fan sites and web communities. Muppet Central is an established Muppet fan site, with information on everything from Kermit to Doozers. There you can find the latest news on film and tv productions, DVD releases, collectibles, and toys and games. There's even a forum for Muppet fans to interact with one another. The Muppets FAQ answers questions like 'What is a Muppet?' and offers explanations such as the reasoning behind most Muppet characters being left-handed! If you want to see the incredible amount of Muppet merchandise and advertising, or find an episode and character guide for The Muppet Show, then make sure to spend some time at Kermitage.com. You can look at some of the fantastic promotional items for movies like Muppet Treasure Island and even marvel at some of the Jim Henson Company Christmas cards. Matthew Springer at Jim Hill Media wrote a nice article about why The Muppet Movie remains one of the best of any film featuring the characters. He attests to the way the characters feel 'alive' and how it "allowed Jim Henson's unique, unforgettable blend of emotional punch, endearing characters, and hilarious jokes to find its greatest expression." While many animation companies today strive to bring 2D characters like Mickey Mouse and Popeye into the third dimension, Jim Henson accomplished the task better than any of them could. Imagine a two-dimensional animated cartoon character, only real, and you can see The Muppets enduring hold on children and adults alike. Though he later 'toyed' with computerized versions of some of the characters and found new ways to showcase them, his creations existed mainly as crafted puppets. It didn't require high-end 3D animation software and an entire render farm to bring Jim's drawings to life; it took only the talented imaginations and hands of the many loyal 'Muppeteers' who stood behind his ideas. If The Muppets' Wizard of Oz fares well, it will likely mean more new material from Kermit, Fozzie, Piggy, Gonzo, and Rowlf in the future. With an African-American lead cast that includes Ashanti Douglas as Dorothy, Queen Latifah as Aunt Em, and David Alan Grier as Uncle Henry, Disney looks to be pushing some cultural casting boundaries. Maybe the choices will bring a diverse audience and good ratings, which is ultimately what The Muppets will need on the Disney-owned network, ABC. In the immortal words of Kermit the Frog: "It ain't easy being green." Whether you're the money used to buy the puppet, or the puppet itself, you're bound to change hands eventually. Let's hope the gang has found a good fit this time. Lost city of Atlantis found?